Need a beautiful, accessible project for kids? 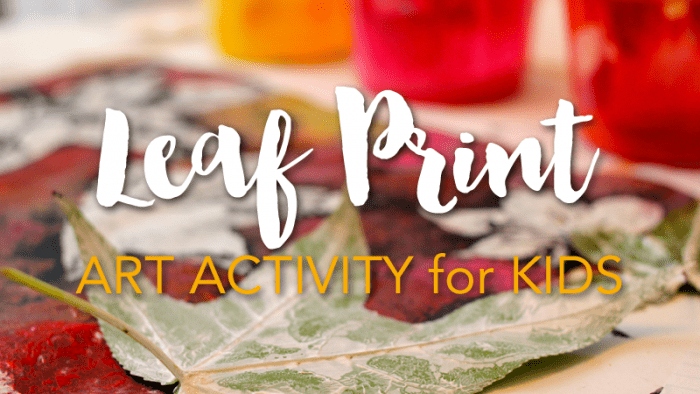 This fall leaves stencil project is perfect. You’ll need to gather 2-4 leaves per child or about 50 leaves for a 25-student class so that each child has a couple of leaves to choose from. Make sure the leaves are fresh, not the crispy dried ones that have already fallen. This is important as the paint must adhere to the leaf well and it will also ensure that the leaf doesn’t crumble. Are you ready for some fall leaves? Place a leaf and black construction paper on each child’s desk/place. Put a stack of scrap paper in the middle of the table. Place one palette of white paint with appropriate number of brushes in middle of table. Demonstrate how to brush the white paint onto the “rib side” of the leaf. Be sure to coat the entire leaf. Place painted leaf carefully on black paper. Cover with a scrap and gently rub the leaf until you are sure all the paint is rubbed on. Lift up the scrap paper then peel the leaf off the black paper. Wow! The kids think this part is amazing. I do, too. Repeat step 5 at least 4 times. Encourage the children to go off the edge of the page for an all-over look. After all the leaves have been stenciled on, bring out the palettes of colored paint along with some small cut-up sponges. Using just one sponge per child, dip sponge in colored paint and dab around leaves. Kids can use two colors, or more. Leave it up to them. Many art teachers and parents have asked whether or not they should apply the colored paint to the black paper first. You could but you wouldn’t achieve the cool black and white affect with the leaves. If you do paint the background first, limit the color choices so that when you stamp the white leaves in place, they will stand out and contrast nicely. This is one of my favorites for Autumn! What about you? What’s your favorite Fall Leaf project? I have used your Picasso lesson, flowers you did with my class last year (adapted to younger kids), and now I am going to use your fall leaves lesson on Monday. I tell you, what would I do without you. 🙂 What’s a good lesson for teaching warm and cool colors with the little ones? I need to import you to Sweden. Thanks for all the ideas!!! I used your leaf print lesson with my Kinders. They turned out awesome. Thanks so much for your great blog. I get so many ideas from you. I hope it is okay, I have used some of your lessons and posted them on my own blog. paint from another class) It turned out really pretty. I am a first year art teacher and you are saving my life! Thank you thank you thank you. You are wonderful. thank you so much for all of these lessons. i teach a tiny little class and your ideas are so awesome and helpful. i have bought several of your lesson packages and have to say the kids looooove the work. thank you for sharing so much!! What a great project! The kids loved it. What is it about working with leaves that feels so relaxing?! Great space you have here, btw. Gorgeous! Can’t wait to try this with the little ones. Yes, I did something similar with my 4th graders. We used warm colors to stamp the leaves…red,yellow and orange tempera on white paper…Day 1 and then after leaves were dried used sharpie markers in black to draw contour lines around the leaves until the page was filled…Days 2 and 3 for most. Then on Day 4 we used watercolor wash in cool colors over the contour lines. They really came out nicely and you are right that the kids love to stamp the leaves ( and yes they must be fresh ) but it was also very messy stamping them. I tied it into science a bit with leaf types using maple, oak and birch. I have used this website for several art projects with primary students. The results were amazing!! I had one teacher comment that I am very artistic- so funny because I am so not!! I tell people that this is the best website ever for art ideas for kids. I just love it!! I am really looking forward to doing this activity with a grade one class tomorrow. I love how the activities here can be done with very young children. Would it work to paint the background colors first, let it dry, then stamp the leaves in white? Otherwise I am afraid mine will lose the outline of the leaves. Great idea Laura. Allowing it to dry does eliminate the possibility of losing the edges but it also adds more time. So instead of this lesson being a one-session lesson, it would require two. Let me know how it goes. This project is wonderful! I have adapted it to suit my grade 6 class. Instead of the sponge painting, I ask the students to use pastels and rubbing. The finished product is amazing!! Hi Patty! Love this lesson (and all your lessons really…)! Do you think Kinders could do this? I am a firm believer of “process not product”, but I don’t want them to be frustrated with it. Thanks for any advice you can give. AND if you already posted this answer, I apologize!! Duh, I just saw that it was a K-1 activity. Please forgive me! Too much going on my head to catch the large print! LOL! Patty – what kind of white tempera did you use? I could not get my white tempera to ‘work’. It did not show up. Any suggestions? Thanks! I use Crayola liquid tempera paint. Faber-Castelo liquid tempera paint world well too. I taught elementary art for 5 years and am now in my 5th year of teaching kindergarten. I did this project with 4th graders when I taught art, but use the EXACT same lesson with my kindergarten kids now. They can do every bit of it and have such fun. Parents LOVE the results as well. I came today looking for something new to do on Friday for our Harvest Center art project…I may just use this old favorite again! Still love your site as much as ever, even though I don’t have nearly as much time for art with all the requirements for kindergarten kids these days. I love this lesson, too. It’s amazing how Kinder art can look exactly like adult art! With all of the leaves that have fallen off the trees around our school yard I had been looking for a quick and fun activity for one of the art classes I teach. I used this idea today with my Grade 4 students and adapted it to using pastels behind the printed leaves and it turned out great. Thank you for sharing your wonderful ideas! Feel free to check out other art projects that we have done in class. This is an amazing idea that we can use as part of our woodland topic! Love visiting your website for inspiration. Thank you! Our white leaf prints turned out beautiful! But my tempera paint was not showing up on the black paper. I started adding white to all the colors to make them more opaque so it would show, but then the colors were looking too pastel and not bright. So I switched to chalk pastels and got great results. But how were you able to get such bright colors with your paint on the black paper? Maybe it’s the paint you are using. I was using Crayola Artista liquid tempera paint (no water added). The paint is very thick and opaque. What brand did you try? Hi Patty! First of all, I cannot tell you how fortunate I feel to have found you!! I am about to begin my first year of teaching elementary art, and finding your blog, art lessons, etc., has been a lifesaver! Question: I just did a trial run of these leaves and found that the paint seems to be absorbing a bit of the black paper’s pigment…dulling the bright white leaf. I used acrylic (after first trying tempera) and it’s better, but still not as white as yours. What brand of black construction paper did you use for this? Thank you! Hi Linda! Glad you found me. Two things, First I use Crayola Artista II white liquid tempera paint. Don’t add water. I use Tru-Ray (Pacon) black sulphite paper. Do not use regular children’s craft construction paper. You’re right. It’s too absorbent. Hi Patty, do you think using silk leaves as opposed to real leaves would work? Great question. They probably would work great. they are a tad more expensive but if that’s all you have, then give it a try. Remember to try it yourself before teaching the kids. I did this project with my fifth grade class and it turned out AMAZING!! 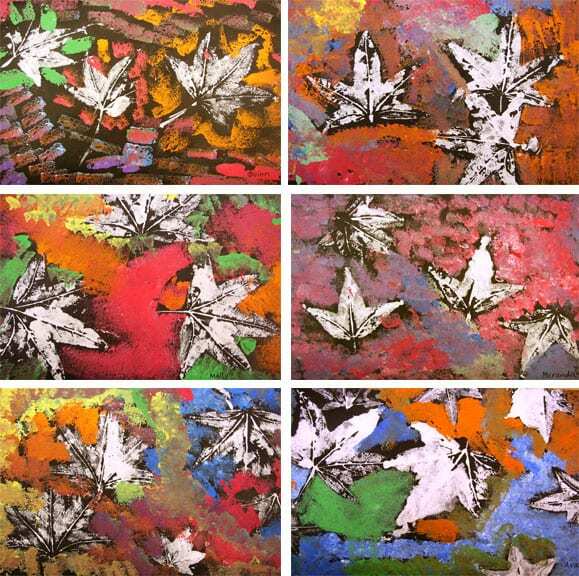 They used red, orange, or yellow for the leaf prints and any complementary color for the sponge printing around it. I just put the finished pieces up in the hallway and they’ve received schoolwide attention. Even the principal asked me how we did them today! Thank you so much. Hello! Thanks for sharing this awesome project. I would like to do this, but because it is almost November, I don’t believe I will find many green leaves. Would it work with pressed brown/red/yellow leaves?